Give me a break! A JanSport Superbreak for back-to-school! Home > Blog > Give me a break! 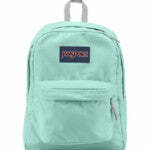 A JanSport Superbreak for back-to-school! Around this time in the month of August, most people are still in the full swing of summer, enjoying grill outs for dinner, daylight in the evenings, and campfires at night. But despite these seemingly endless summer days, the back-to-school shopping season is already upon us! I’m sure that your kids, department stores, and now online camp-outfitter blogs refuse to let you forget that the new school year is right around the corner. Nevertheless, I want to tell you about one of the most essential pieces in your back-to-school prepping: the back-to-school backpack! If you’re looking for the perfect school pack to take along on your back every weekday, Everything Summer Camp offers just the ticket. It’s the JanSport Superbreak. Bringing ‘vintage’ back in style, this classic pack is the original JanSport backpack. In fact, it’s the #1 backpack in the entire world! Weighing in at only 12 oz., this lightweight pack has one large main compartment and a front zippered pocket to help keep essentials and small items handy. While it can work as the perfect day pack for summer camp hiking, school is really its cup of tea. It’s more than spacious enough for all your heavy textbooks and school supplies you’ll need to transport. Get all your friends at school and other classmates to see you sporting this fashionable JanSport backpack. Available in cool colors and fun designs, the Superbreak looks great on boys as well as girls. Just pick your favorite of the seven options! Stitched with 600 Denier polyester this backpack is very durable. It’s easy to care for too—simply wipe it clean and let it air dry. With 1550 cubic inches of storage, the Superbreak stands at 8.5″ D x 13″ W x 16.7″ H. And, of course, like all JanSport bags, the Superbreak is guaranteed for life.